Of all the features introduced in Google AdSense, the Allowed Sites new addition is probably the most useless to me. Allowed sites are authoritative sites or URLs on which AdSense publishers allow or wish to have their Google ads displayed. To me, it’s not a major concern as who else on earth would want to giveaway free money to you by using ad code on their websites with your AdSense publisher-ID? However, for some others, there are valid concerns too, as raised by webmasters as in this discussion thread in Webmaster World Forums. The main problem that AdSense publishers concerned about is potentially malicious behavior from others on the web, such as stealing their ad code and placing it on an inappropriate site that violates AdSense terms and conditions. This act of sabotage can get the AdSense publisher account banned. Besides, there are possibility of other scenarios such as where some pirates copy and paste the genuine web pages into their website without even stripping out the Google AdSense ad code, and unknowingly made liable for any TOS violation other sites made. To activate the Allowed Sites for your AdSense account, simply sign in to AdSense, then go to AdSense Setup -> Allowed Sites, which is located at URL link https://www.google.com/adsense/publisher-whitelist-view. Here, you can configure and set up the URLs that are allowed to display Google ads for your account. 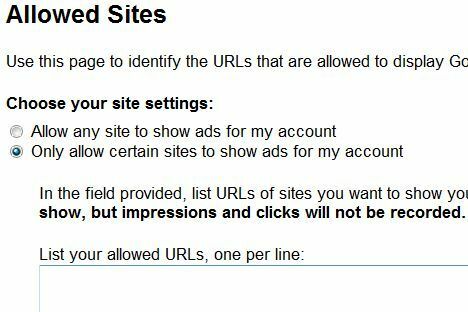 Two options are available – Allow any site to show ads for my account, which is the default, or Only allow certain sites to show ads for my account which must be selected in order to be able to list allowed URLs. Allowed Sites is now consolidated under Site Management, accessible under Account section of Gear icon -> Settings. 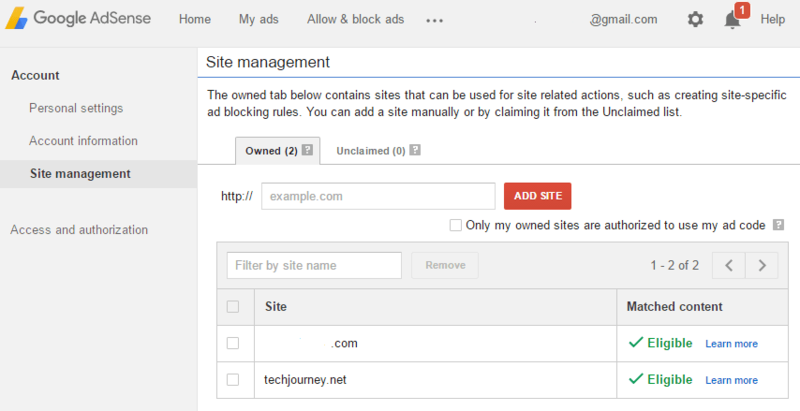 Site management allows publishers to claim owned sites which can be applied with site related actions, such as creating site-specific ad blocking rules. To restrict AdSense ads to owned site, check the Only my owned sites are authorized to use my ad code. There are some limitations though. If your websites are on subdomain in the sub-folder format (i.e domain.com/mysite) that the whole domain.com must be allowed as folders or paths are not supported. Beside, if a URL displaying your AdSense ad code is not on your Allowed Sites list, ads will still be displayed, but impressions and clicks won’t be recorded, advertisers won’t be charged, and you won’t receive any earnings for that URL. Thus if you care more about money you received, rather than the risk of been penalized by Google from act of others, you probably don’t want to enable this Allowed Sites function. One thing Google can helps publishers is probably to list out whichever sites that an AdSense ID is getting impressions and clicks from.